All About Nerves Worksheet – Download our fun, FREE printable easy Science worksheet hidden words game for kids. This fun worksheet with fun facts about the nervous system, includes a hidden and missing words game as well as a find the missing words search game for kids. This free science worksheet is ideal for Grammar school kids in Grades One to Five as well as Pre-K kids and Kindergarten kids. Your kids will enjoy learning fun facts about how your nerves work while playing the hidden words search game. Grammar & Primary school kids can use this easy science activity sheet as a reading comprehension worksheet. Younger kids in preschool and kindergarten can enjoy the missing words game as a listening comprehension worksheet. Parents can download our free printable science worksheets and use for homeschooling their kids. Educators and teachers can use our easy science worksheets to supplement their science classes, after school enrichment programs and distant learning programs. Our easy science for children website offers many more free to download easy science activity sheets, free printable science worksheets and free hidden words game puzzles for kids. What are the nerves main functions? How does the nervous system work? The brain is the center of the nervous system. It controls everything in your body. Messages from your body can zip to your brain at a speed of 200 mph. Do you know how your nerves of the body work? Discover more nervous system facts and all about nerves fun facts by downloading the free easy science worksheet. 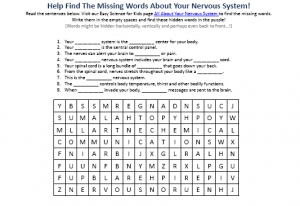 [sociallocker]Download this easy science worksheet words game about the nervous system. Download the FREE Nerves Hidden Words Game for Kids! Did you like our FREE Nerves Worksheet? Find out lengthy info about the Nervous System here. Declan, Tobin. " Nerves - Free Printable Easy Science Worksheet Hidden Words Game - ." Easy Science for Kids, Apr 2019. Web. 26 Apr 2019. < https://easyscienceforkids.com/nerves-free-printable-easy-science-worksheet-hidden-words-game/ >.